More and more, colleges and universities across the nation are supplementing their traditional campuses with fully and partially online degree programs that can be accessed from around the world. Online programs are often aimed at serving working adults or traditional college-aged students, perhaps homeschooled students, who prefer or need the flexible and student-led atmosphere found in online learning. In most cases, online programs offer the same quality education as on-campus. All universities listed below have solid ROIs, are accredited regionally or nationally, and are located in the state of Louisiana. The institutions are ranked keeping with the Value Colleges commitment, which evaluates a universities success and ROIs with their tuition costs and online degree earning options. Because online program tuition costs tend to vary within institutions, tuition costs listed below are the annual IPEDs. All schools offer programs that can be earned 100% online and some include partial online programs such as certificates and hybrid courses. Northwestern State University was founded in 1884 and is a student-oriented institution and leader in education, both on campus and online, in Louisiana. The school prides itself in being committed to the dissemination, acquisition, and creation of knowledge through teaching, research, and service. Northwestern State University online is the home of eNSU. 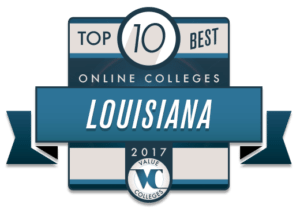 eNSU is Louisiana’s largest and first distance learning program and online campus and offers the same quality education online as is offered on the universities traditional campus. The school offers thirty-eight fully accredited online degree programs plus fifteen add-on certifications! Taking a responsibility to offer affordable education to students across the country, there are no out of state fees for online learners. Additionally, the school is military friendly and has been designated a 2015 Military Friendly School by Victory Media. The university is accredited to offer associate through master degree programs, plus specialist programs and certificates. Some fully online degrees offered include programs in General Studies, Radiologic Sciences, and Computer Information Systems. The University of Louisiana at Monroe is a unique campus offering quality academics to students from across Louisiana and the nation. The school is a four-year accredited university offering undergraduate and graduate degrees in the humanities, business, nursing, and much more. The school prides itself in combining a variety of fields of study with innovative and state-of-the-art technologies to all students both on the traditional campus and online. Plus, some of the same faculty that leads courses on campus also provide educational opportunities through the online learning portal as well. The University of Louisiana at Monroe online offers over thirty online degree programs along with a wealth of student resources and a caring community to support distance learning students through their academic achievements. Often referred to as eULM, the online school offers services like admissions counselors, advisement, and library services to online learners. Students can choose to obtain degrees in the following areas: the Behavioral Sciences, Business, Education, Humanities, General Studies, and the Health Sciences. Located in Thibodaux, Louisiana, Nicholls State University is a regional university that serves a diverse population of both traditionally college-aged students as well as adult learners and non-traditional students. The university, nicknamed The Colonels, was founded on September 23, 1948. Nicholls State University online is committed to offering accelerated and affordable online learning to students from many walks of life and various educational backgrounds. The online programs offer the same quality education as is found on the traditional campus and the same faculty members who teach online courses have all completed acute training to better understand the challenges online students may face. With flexibility as a focus, classes can be accessed at the student’s leisure, allowing pupils who juggle work, family, or other commitments ease in completing coursework. Some programs offered include degrees in Mass Communications, English, Marketing, and Master of Education degrees to name a few. Founded in 1894, Louisiana Technical University is located in Ruston, Louisiana and is a four-year research institution offering bachelor to doctorate degrees. The school is proud to be a comprehensive public university offering quality and competitive education online and on their traditional campus. Often called Louisiana Tech, the institution serves students from across the United States and from over sixty countries from around the world. With affordability as a focus in addition to quality learning, over 70% of students attending university at Louisiana Tech receive some form of financial assistance. The Global Campus at Louisiana Tech University online provides the same quality learning found on campus in an online learning environment. In addition to serving student, the distance learning programs services businesses, employers, and a number of various industries across the nation through accessible learning opportunities, plus academic and professional development coursework. All courses are highly interactive and the online school is additionally accredited to offer baccalaureate to doctoral degrees. Some fully online programs offered include a bachelor degree in Health Informatics and Information Management and master degrees in English, Business Administration, Health Informatics, and more. McNeese State University was founded in 1939 and was originally called Lake Charles Junior College, named after its location in Lake Charles, Louisiana. The schools mission to strive for “Excellence with a Personal Touch” can be seen across the board in all areas of study both on the traditional campus and in their online academic programs. McNeese State University online proudly offers a variety of affordable and accessible undergraduate and graduate degree programs both fully and partially online to students around the globe. All the programs offer the same quality education as found on the traditional McNeese campus but are designed to allow students to obtain their degrees at their own pace. Some fully online programs offered include bachelor or master degrees in Psychology, Business Administration, General Studies, Management, Criminal Justice, Nursing, and Health Promotion to name a few. Louisiana State University and Agricultural and Mechanical College, located in Baton Rouge, is a leading university in Louisiana. The school was originally founded as a land grant in 1806, 1811, and 1827 before combining and evolving to become the leading institution it is today. The school is committed to providing not only exceptional academics but also affordable and accessible higher learning opportunities both on the traditional campus and on the online portal. Louisiana State University at Baton Rouge online carries the same prominence as the traditional campus and is additionally committed to providing accessible academics to students that seek intellectual development remotely. The school promises to offer the same high standards of learning through research and creative economic opportunities online. As a Flagship university, the online programs prepare students for life outside of college and challenge them to meet the economic, social, scientific, environmental, and creative challenges that confront society worldwide today. Some fully online programs offered include degrees in Business Administration, Educational Leadership, Construction Management, Social Work, Agricultural Education, and much more. Degrees are offered from the baccalaureate to doctoral level. Louisiana State University at Alexandria or LSUA, provides quality undergraduate level academics to students from across Louisiana both on campus and online annually. The publicly supported institution is a proud leader in offering affordable undergraduate degrees in a competitive and robust academic environment. The school was founded in 1959 as a two-year commuter college and today is happy to offer four year degrees in areas such as Biology, General Studies, Elementary Education, Nursing, and more since 2003. Since 2015 LSUA has been offering fully online degree programs as well. 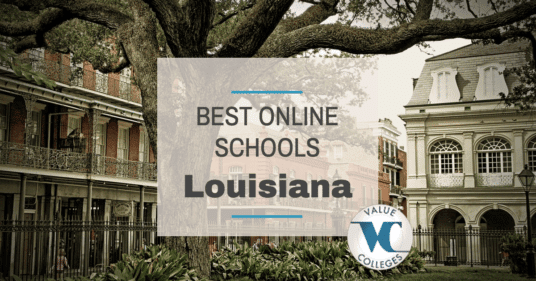 Louisiana State University at Alexandria online proudly serves students looking for increased academic opportunities that lead to more career choices and greater job satisfaction. With these missions in mind, the online programs offer flexibility in learning and affordable, quality educational offerings from students from all walks of life. Offering twenty-three different degree programs, students have a wealth of options to choose from and with financial aid offerings and part time enrollment, coursework becomes affordable. Some programs offered include degrees in General Studies, Art, Early Childhood, Nursing, Business Administration, Elder Care Administration, and more! Founded in 1898, University of Louisiana at Lafayette prides itself in offering authentic academics and experiences to its diverse student body both on the traditional campus and through its online offerings. The school self-professes a mission of inclusion that strives to bring everyone, regardless of race, religion, background, or ethnicity, to the same table through a celebration of diversity. As the second largest university in Louisiana, the University of Louisiana at Lafayette offers degrees from the humanities to the hard sciences and is a national leader in the areas of computer science, nursing, and environmental biology. The University of Louisiana at Lafayette online offers fully and partially online undergraduate and graduate degree programs to students from across the globe. The research university is proud to offer the same quality education online as is offered on the traditional campus and the university is one of the nation’s best institutions for undergraduate education according to the Princeton Review. In fact, the online program earned the Sloan-Consortium (Sloan-C) Award for Excellence in Faculty Development for Online Teaching in 2013! Some fully online programs offered degrees in Nursing, Kinesiology, Organizational Leadership, Systems Technology, and Accounting. Southern University and A&M College is located in Baton Rouge and is a leader in higher education in Louisiana, excelling especially in areas of Nursing practice. The School of Nursing has been named Nursing School of the Year by the Louisiana State Nurses Association and Louisiana Nurses Foundation. The university also boasts strong schools of Engineering and Business and offers a wealth of other undergraduate and graduate degree options. Southern University and A&M College online is part of the comprehensive, four-year university’s educational offerings, and serves students across the state of Louisiana, the nation, and the world. The online portal offers degrees in over fifty areas plus doctoral degrees and certificate options. In addition to traditional academics, the school has divisions of Military Sciences, Naval Science, and International Education. Some fully online programs offered include degrees in Computer Science, Family Nursing, Criminal Justice and Rehabilitation Counseling. The University of New Orleans called UNO for short, was founded in in 1958, and since its founding has been a leader in and committed to diversity and inclusion. The school was the first fully integrated public university in the south when it opened in 1958 and proudly continues to serve this vision of inclusiveness today. The school serves students from across Louisiana, from all fifty states, and from more than 130 counties around the world. Additionally, the nationally ranked institution is a major business driver in metro New Orleans and proudly serves its local and global communities through providing quality academics and social engagement. University of New Orleans online offers the same diverse opportunities and serves the same diverse populations as the traditional campus located in the bustling city of New Orleans. The research-based institution promotes affordable education for all and adds to the city’s industry, culture, and economy even through its online offerings. Students can expect to get the same inclusive, rigorous education as found on campus in their online experience with the flexibility of completing courses remotely. Some fully online undergraduate and graduate programs offered include degrees in the Romance Languages, Interdisciplinary Studies, Coastal Engineering, and Coastal Sciences.